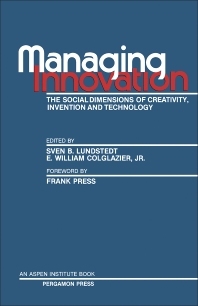 Managing Innovation: The Social Dimensions of Creativity, Invention and Technology focuses on the relationship between inventions and innovations with industrial development and economic advancement. The book stresses the point that advancement in industries and economy can be more successful when these are in balance. Containing the works of various authors, the book proceeds by highlighting the social dimension of invention and innovation. The role of the government in the promotion of innovations and inventions is also noted. The book also reiterates the point that human factors have definitely affected innovation and productivity. This stance is supported by the discussion on a case study in labor-management cooperation. Inventions and innovations in the social dimension are also established to be related with industrial productivity. The book also touches upon how education has influenced the advancement of technology in Japan. The text is best suited to those who are interested in pushing the role of inventions and innovations in shaping the society.